The property is located on the first floor and attic of an Art Nouveau villa. It has a separate entrance over the large and very well-kept garden. A spiral staircase leads from the garden to the spacious roof terrace with the front door. From there it goes into the small kitchen with stove, dishwasher and refrigerator and in the large living-dining area. Another staircase leads to the attic, where there is a spacious bedroom with two single beds. Further sleeping possibilities are available in the bedroom and in the room in front of it. In the attic is also the bathroom, which is equipped with a bath with shower facilities (renovation with shower in planning). The large garden around the house can be shared. 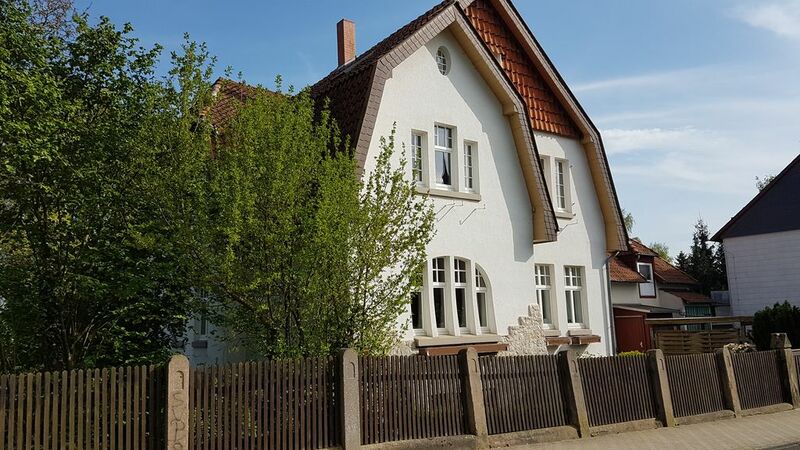 The pretty city center of Bockenem with various shops and a large supermarket is within a few minutes walk, as well as a nearby park and the - only open in summer - modern and very attractive outdoor pool in the city. Excursion possibilities by car or bike u. a. into the Harz foothills (eg Bodensteiner cliffs) and the family park Sottrum. Hildesheim in the north or Seesen in the south can be reached in about 20 minutes by car. The Harz with its many recreational activities is in the immediate vicinity. The lively city of Golsar with its outstanding sights - UNESCO World Heritage Site - can be reached in about 30 minutes by car. The trade fair city of Hannover can also be reached in about 30 minutes via the A7 motorway. We were visiting relatives in town and needed a place to stay. Sebastian’s apartment was well appointed to town. It was up a spiral staircase, had a large and sunny balcony overlooking a well maintained garden. There was a large bath tub, living room to relax and read and comfortable beds. I’ve already recommended it to my Bockenem family. Guter Ausgangspunkt für Trips in den Harz. Gemütliche, nett eingerichtete Wohnung mit ausreichendem Platz. Für mich ideal, aber viele Treppen, wen es stört...Freundlicher Vermieter! Es hat uns gut gefallen. Man fühlte sich wie zu Hause! Ein wunderschönes Haus! Es strahlt außen wie innen Gemütlichkeit aus. Treppen und Stufen setzen Beweglichkeit voraus, darauf sollte man aufmerksam machen. Vielleicht habe ich das aber im Vorfeld auch übersehen, da diese Überlegung für uns nicht relevant war.